The model featured in the Ralph Lauren Photoshop stick insect outrage - in which she was Photoshopped to within an inch of her life - claims she was sacked by the company for being "too fat". 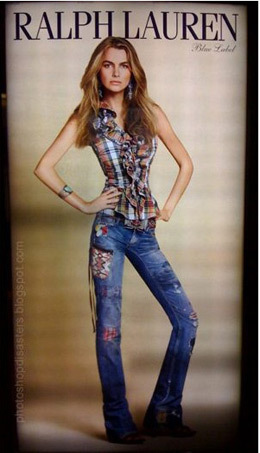 Filippa Hamilton suffered such an extreme digital makeover in an ad for the fashion company that BoingBoing was prompted to gasp: "Dude, her head's bigger than her pelvis." Ralph Lauren quickly threw DMCA takedown notices at BoingBoing and PhotoshopDisasters for exposing the folly, but subsequently decided to apologise. It said in a statement: "For over 42 years, we have built a brand based on quality and integrity. After further investigation, we have learned that we are responsible for the poor imaging and retouching that resulted in a very distorted image of a woman’s body. "We have addressed the problem and going forward will take every precaution to ensure that the calibre of our artwork represents our brand appropriately." Hamilton, 23, now claims she was in fact ditched by Ralph Lauren back in April, before the offending image surfaced, because she was "too large". She said: "They fired me because they said I was overweight and I couldn't fit in their clothes anymore." The model, who is 120lb and 5ft 10in tall, said she decided to go public after she saw the snap of her Photoshop-ravaged frame. She told the Today show: "I saw my face on this super-extremely skinny girl, which is not me; it's not healthy, it's not right."